Fox has set out to create an infographic for every episode of the public radio show. We talked to him about this slightly insane goal. Fast Company: I had never realized that the show had so many facts and figures. Were you listening to an episode when this dawned upon you? Fox: One of the graphics I recently completed, on the episode about Penn State being the #1 party school, was probably when the whole idea came together for me. They would add context to the personal stories their producers were documenting by talking about the statistics surrounding the characters in those stories. And that context really allows you to pull those individual stories and fully realize how representative they are of what is going on on in the big picture. FC: What’s your process? Do you listen to the show and take notes? Then what? Fox: I’ll usually pick an episode that I’m thinking about doing and listen to it a couple of times through my work day before I even start taking notes. If something really jumps out at me I might grab my notebook and jot it down. But usually I end up visualizing the things that I stick out in my memory after a couple of listens throughout the day. I let my mind sort of boil down the episode into a couple of elements I want to explore. FC: I can almost see these being used as a kind of teaching tool for listening comprehension. Have you thought of any applications for them? Fox: I honestly haven’t thought very much about the “use” of these This American Infographics I create. I personally see them as an exercise in visualizing information and concepts. Of course, the aim of the graphics is to be as straightforward, simple, and truthful as possible. But I feel very strongly that I am simply giving my perspective on the subject, what I personally wanted to explore more in the episode. I’d really love to distribute the graphics via an iPad app. I think that the iPad is just the right size to experience the graphics. I’d love to make an app where you could plop your iPad down in your dock, play one of the episodes, and as the different acts went by different data visualizations would appear on the screen relating to what you were hearing. FC: I see at first you started out really strong with one a day then you had to scale back. Is it because you were getting too much outside work from the success of this? Fox: That is in fact the case. I’ve been extremely lucky with the interest in the project, and I really appreciate everyone retweeting about it, blogging about it, and asking me questions about what I am doing. I wish that I could be doing more graphics for TAI but the fact of the matter is I’m not making 1 cent from the project, and I’m really uncomfortable with putting ads on the Web site. I think that anyone who might consider donating to me for making the graphics should probably instead donate that money to This American Life. As it is right now, I’m creating and posting episodes in the free time I find between client work. That’s right, after a long hard day of making infographics for clients, I make infographics for free, for me. FC: Why do you think our culture is so obsessed with infographics? Fox: I think that a lot of people (like me) gravitate to visual things rather than a couple of paragraphs of text. If I can take some information that when written takes a couple of paragraphs to explain, and make a visualization of that, I am cutting out some serious time between the person becoming interested in the topic “ah, this information appeals to me” and their understanding of the topic “ah, I get it, I could explain this to my friend.” I think that visualizing the information can make understanding the data a lot more gratifying to the reader. I think that infographics are entering journalism much as photography entered it. At first a novelty, adopted by the forward-thinkers and appreciators of art and beautiful things. But then accepted as a necessity, another way for the reader to experience the information. A new perspective of truth on a subject. 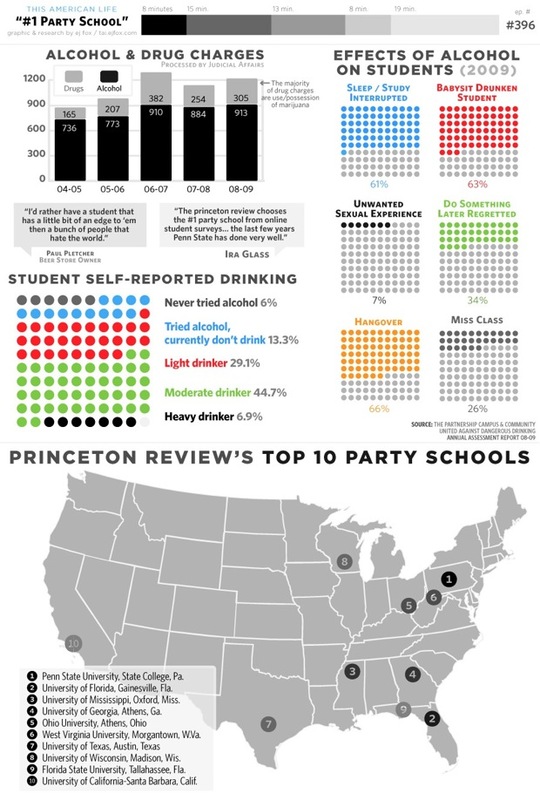 I think that infographics are an easy compliment to journalism right now. Written text, in my opinion, is not the most conducive way to explain a series of complicated statistics and numbers. FC: What was interesting or revealing to you about today’s infographic, True Urban Legends? 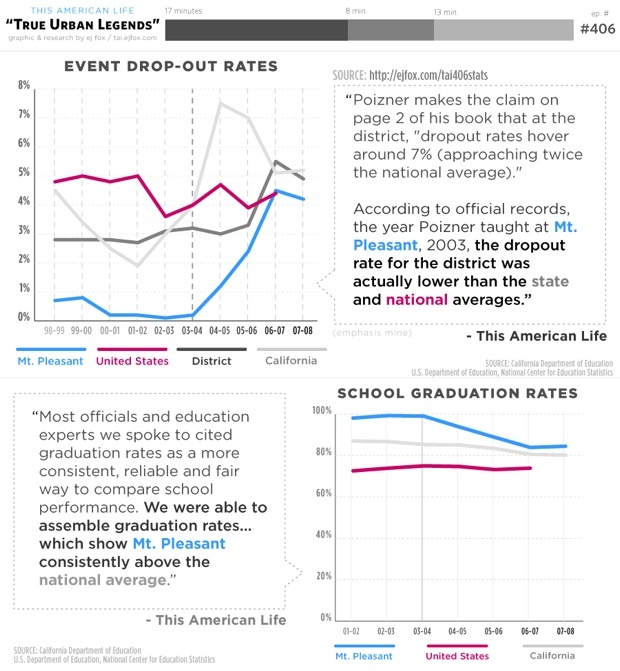 Fox: I’m really glad that the This American Life team decided to post a page detailing the data and statistics they cite in the episode. It made my life a lot easier, and I think it helps the graphic connect more directly with the episode. I think that this show gave me a chance to do exactly what I was aiming to do with the project, too. In the episode Ira Glass is telling you these statistics, and they sort of flew by without me understanding the full depth of them, and I get a chance to really show you the numbers definitively so you can judge for yourself whether the character in the story was mischaracterizing what the numbers showed.